First Selectman Kevin Moynihan said during Tuesday’s meeting of the Board of Finance that the next phase of the natural gas installation project, bringing it to the downtown, will start in April. First Presbyterian Nursery School aced its most recent unannounced inspection by the New Canaan Health Department. It was conducted Dec. 11 and officials found no code violations at the Oenoke Ridge Road facility. Looking to do something special on Valentine’s Day? Aetheria Relaxation Spa on Cherry Street is hosting a “Package of Love” that includes a duet massage, flowers and chocolates, a $25 gift card to Red Grape Wine and dinner for two at Cava Wine Bar. Starting Feb. 19, Town Hall hours will shift 30 minutes earlier, to 8 a.m. to 4 p.m., a decision made by the first selectman to help municipal workers who use busy roads such as the Merritt Parkway. Moynihan also is seeking the public’s feedback on proposed “special summer hours” that could include one late-day of closing hours—for example, staying open until 6 p.m. Mondays or Wednesdays—while closing at 1:30 p.m. Fridays. 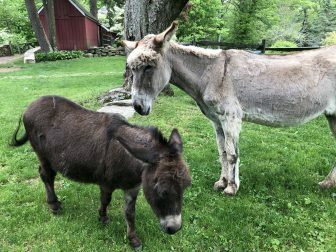 The town on Wednesday issued a permit allowing the installation of a new pre-built barn at the New Canaan Nature Center that will house four donkeys. At a cost of about $6,000, according to the permit, the 360-square-foot barn will sit on a 30-by-12-foot stone bed. Congratulations to Rucci Law Group’s George Reilly, a nine-time, top-rated attorney included in New England Super Lawyers and Kate Diehm, a “Rising Star” for three years in a row! Reilly has also been recognized in Best Lawyers in America 2019 and an “Honored Listee” in Marquis Who’s Who in America 2018. A reminder that New Canaan Library’s Spring Edition of the “Author Talk and Lunch,” to be held March 7, features Tayari Jones, author of the novel “An American Marriage.” Tickets are on sale now and details can be found here. 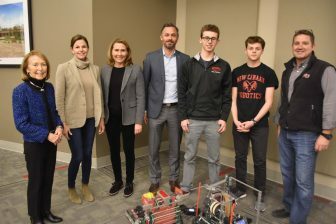 L-R: New Canaan Public School Board of Education members Hazel Hobbs, Katrina Parkhill, Vice Chair Dionna Carlson, Chair Brendan Hayes, NCHS students and Vex Robotics team members Ben Levin and Mark Levin, and NCHS Technology teacher Jim Zambarano. Congratulations to the New Canaan High School‘s Vex Robotics Team, which advanced into the Southern New England Vex Robotics Regional Competition taking place March 2 to 3, in Worcester, Mass. Members of the team made an informal presentation to the Board of Education prior to its Jan. 22 meeting. The New Canaan Land Trust is holding its free “Stone Wall Building Workshop” from 8 a.m. to 12 p.m. Saturday at Hicks Meadow, across from 514 Silvermine Road. In addition to a number of habitat restoration projects at the Hicks Meadow, the nonprofit organization is continuing its efforts to rebuild a historic stone wall along Silvermine Road. Local stone mason, Greg Faillaci will teach participants the art of building a dry stone wall. This event is weather-dependent, so please RSVP to Info@NewCanaanLandTrust.org in case inclement weather forces NCLT to reschedule. The Land Trust also is announcing its summer steward internship for local high school students. Details about the popular program, including application instructions, can be found on the NCLT website here: https://www.newcanaanlandtrust.org/summer-steward-internship. Building Forum 1-9-19 from NCTV 79 on Vimeo. Op-Ed: Who Should Control New Canaan’s Schools? QUICK UPDATE: The NCLT stone wall workshop will begin at 9am, rather than 8am as originally planned.